Last month, USA Today published a list of the companies that paid the most income taxes in 2012. 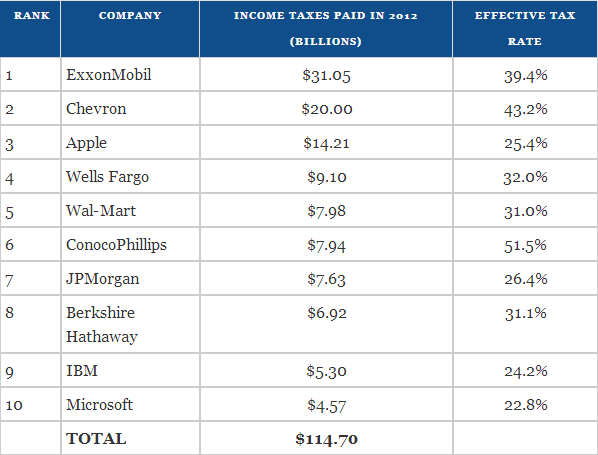 Mark J. Perry over at the AEI blog created a table containing the amount these companies paid and their effective tax rate. The most astounding fact from this chart is the amount of taxes paid by the three oil companies on the list and their effective tax rates. 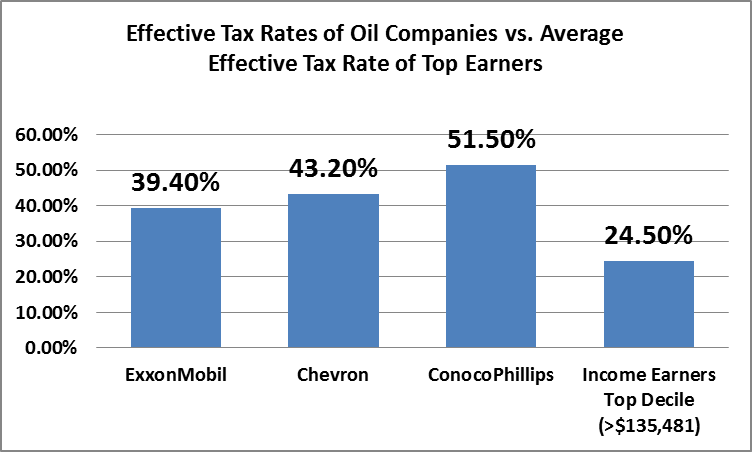 ExxonMobil, Chevron, and ConocoPhillips collectively paid $59 billion dollars last year for an average effective tax rate of 44.7 percent for their taxes throughout the world. The numbers are large in and of themselves, but how large? 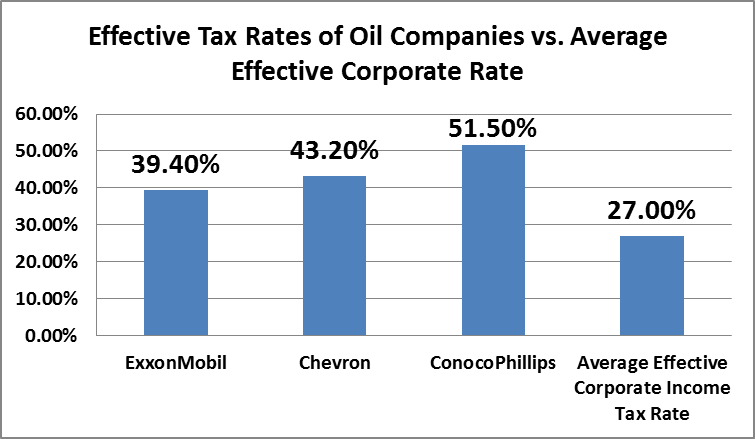 The effect tax rates of ExxonMobil, Chevron and ConocoPhillips- 39.4, 43.2, and 51.5 percent respectively- are all higher than the 27 percent average effective corporate tax rate for all U.S. corporations. 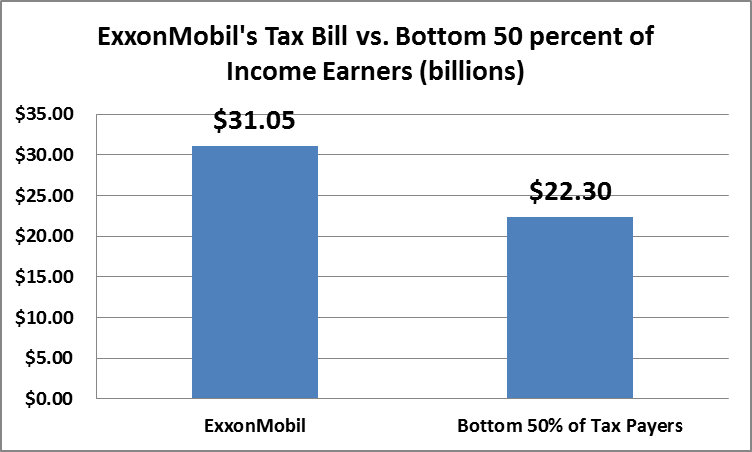 As Mark Perry pointed out in his blog, ExxonMobil paid $31.05 billion dollars in taxes, more than the entire bottom 50% of income tax filers paid in 2010. Even more, their effective tax rate is higher than the 24.5 percent average effective tax rate paid by the top quintile of income earners in 2011. 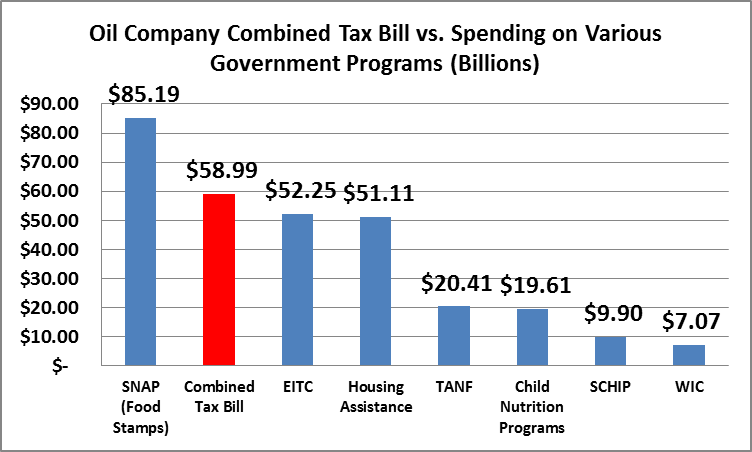 Lastly, the combined tax bill of these three oil companies could nearly fund spending on Temporary Assistance to Needy Families (Welfare) three times in 2012. And these numbers are just the income taxes paid. Like we have pointed out before, the oil and gas industry also has to pay other taxes such as excise taxes on gasoline, meaning this understates what the true burden is. By any measure, oil and gas companies are heavily taxed. This bill would bring back three proposals that have been kicking around Congress for a few years now. All three of them target the oil industry for higher taxes. 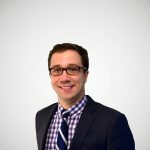 First, this bill will prevent the use of “last-in, first-out” (LIFO) accounting specifically for oil companies, while leaving these provisions for other companies. This accounting method allows companies to assume that the last inventory purchased is the first sold for tax purposes. What it does is allows companies to reduce their tax burden in the face of increasing commodity prices. Oil companies, as a result, will see higher tax bills if prevented from using this accounting method. The second provision in this bill will end dual capacity. Specifically, this law will split the corporate income tax oil companies pay in foreign countries into a royalty piece and an income tax piece, reducing the amount of the corporate income tax that is creditable. This exposes oil companies to double taxation on their foreign earnings. One of the inviolate principles of sound tax policy is that a dollar of income should be taxed only once as close to the source as possible. In keeping with this principle, the U.S. tax code affords multinational firms a credit for income taxes paid to other governments on their foreign earnings. Oil companies are frequently subject to extra layers of taxation in countries such as Norway (the total income tax for oil companies is 78 percent) and Saudi Arabia (the total tax for oil firms is 85 percent) so the tax code allows these "dual capacity" taxpayers to deduct more than the base rate of tax. Eliminating this well-established (and well-litigated) provision will subject these companies to U.S. tax on income that was already highly taxed abroad. The third provision is to limit the use of IRS code Section 199 for oil companies. This is the same provision that Obama has continually called a subsidy for oil, gas and coal companies. However, this provision allows any company to deduct domestic manufacturing activity from their taxable income. It may be the case that this is bad tax policy; the United States should probably be lowering the corporate income tax for everyone rather than creating loopholes for manufacturing activities. However, it is still not correct to call it a subsidy for the oil industry. Limiting this deduction for oil companies will target them with higher taxes, while letting other manufacturers continue to lower their burden. These near-annual proposals are all focused around the assertion that the oil and gas industry pays little in tax. Of course, just looking at what their tax burden looks like from the above charts, this is simply not the case. Oil companies pay billions in taxes every year. This is a fact that politicians simply gloss over. Politicians should focus on how to make the tax system better and stop targeting oil companies to score political points.